Not a day goes by without a thought of you, I miss you. We are one forever. 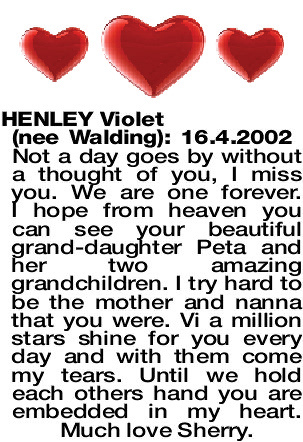 I hope from heaven you can see your beautiful grand-daughter Peta and her two amazing grandchildren. I try hard to be the mother and nanna that you were. Vi a million stars shine for you every day and with them come my tears. Until we hold each others hand you are embedded in my heart. Much love Sherry.